It’s a little hard to believe Pattern of Rebirth hasn’t been in any sets since Urza’s Legacy and the 2000 edition of the World Championship gold-bordered decks. It’s a really fun card to build around, working effectively with any sacrifice outlet to get a huge creature out of your deck. This is, of course, less reliable than the conventional ramp deck, but it’s more fun for some people, and also has the added side effect of protecting the enchanted creature in certain ways. Some opponents will be reluctant to block or target a creature enchanted with Pattern of Rebirth, lest it turn into a Kalonian Behemoth or Akroma. It also has great alliance-making value in multiplayer settings, where you can effectively “loan” it to another player or a Two-Headed Giant partner and hopefully help you both! Turning a small creature into Mister Biggles? Sounds like a fair deal. 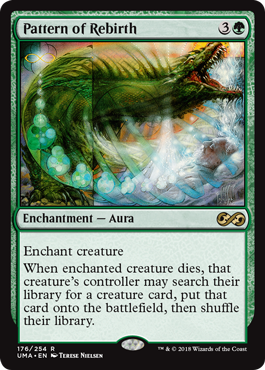 Pattern of Rebirth is a card that can be used fairly or, more likely, unfairly, thanks to being able to grab any creature when the enchanted creature meets with an unfortunate death experience. It especially pairs well with sacrifice outlets, be it on the creature or on another card (like Phyrexian Altar, to give an example). It’s a bit slow for Legacy for the most part, since there are ways to keep Pattern of Rebirth from doing its thing and it is soft to countermagic. (Plus, it’s better to cheat a creature out and give it haste than just cheating it out.) That said, it’s absurd in Commander (where tutoring is always welcome), and a reprint of an absurdly scarce card (only printed in Urza’s Destiny) is always welcome.